If you start building your obby above the grey baseplate, your player will just fall harmlessly onto the baseplate rather than dying when they miss their jump. That doesn’t exactly give your player the challenge you want them to have. 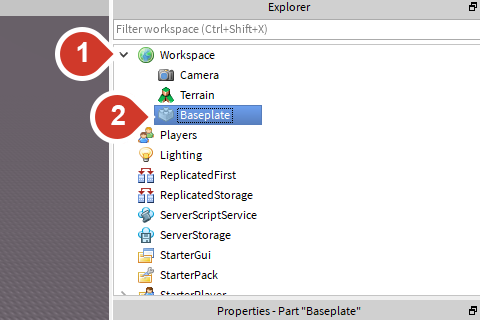 To remove the baseplate, you’ll need to use the Explorer Window. 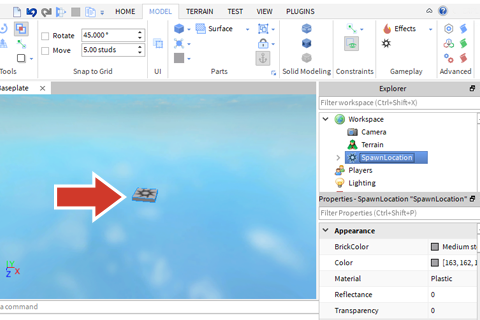 The Explorer window is typically to the right of your workspace and lists all the objects within your game. You can use the Explorer to select and work with parts in your game even if you can’t find them in the 3D view. 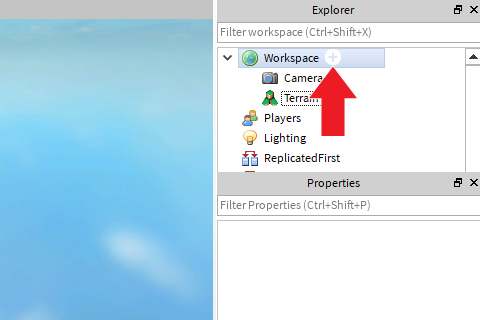 Click the arrow next to Workspace in the Explorer window. By deleting the baseplate and starting with a blank space, students are able to better focus on core skills like manipulating the camera and blocks. 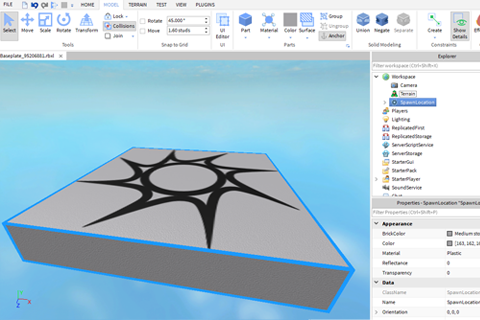 Once they learn tools such as terrain creation, it’s difficult to get students to go back to the basics of blocks. The first thing to do when creating a game is determine where players start. The SpawnLocation is where a player appears in the world at the start of the game or after falling off a platform. Without a SpawnLocation, the player might appear somewhere randomly and fall to their doom. In the Explorer window, hover over Workspace and click the circle + button. Scroll down the drop-down list until you find SpawnLocation and click on it. The SpawnLocation will be created at the exact center of your camera view. Creating the default spawnLocation first prevents students from getting lost in 3D space as they build and playtest in the next few lessons. The spawnLocation acts as a landmark for students as they learn to control the camera and place blocks. If parts are too far away from the camera, they can be difficult to work with. Use the camera controls and hotkeys to get a better view of parts you are working with. 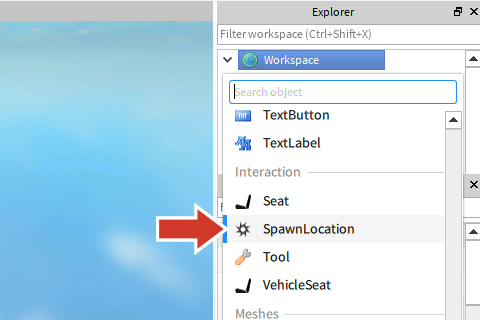 Select SpawnLocation in the Explorer. Press F to focus the camera on the selected part. Strongly encourage your students to use the F hotkey to focus on part. Students may get into the habit of always using the WASD keys to move to an part when they could easily press F.
Now that you have an object in your game, click in the 3D view and move the camera around to get a better view. 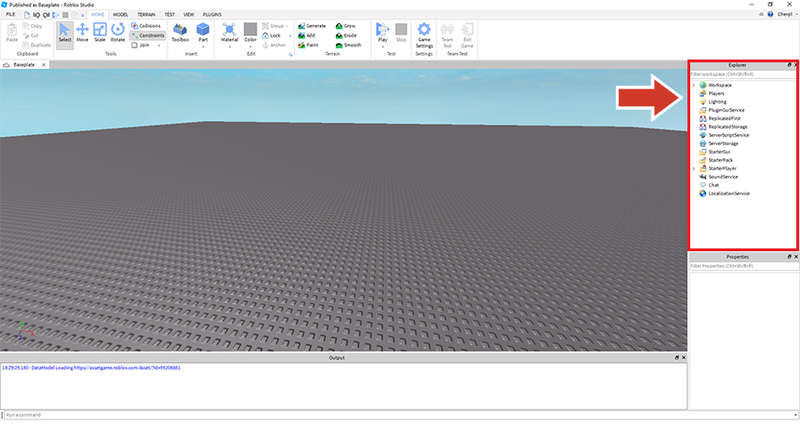 If the camera doesn't move, first click inside the game editor. For example, if you click on the Explorer window, you won't be able to use the WASD keys to move in the game editor. Playtesting is the process of you or a peer playing a game to make sure everything works and figuring out how to make it even better. The bigger the game, the more likely it has gone through many, many hours of playtesting. Playtest your game whenever you make changes. Look for areas that can be improved. Save your game. Remember to change the file name. Camera controls in the game are similar to when you are in the editor. Any changes you make while in Play mode won’t be saved. You’ll have to do them all over again when you go back to editing.